Fifth book in the Sha’Daa Series is now for Sale! 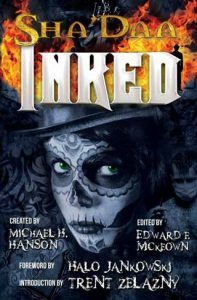 Purchase SHA’DAA: INKED now! Browse: Home » Fifth book in the Sha’Daa Series is now for Sale! Purchase SHA’DAA: INKED now! That is right lovers of Eldritch, Urban Fantasy, Adventure Fiction! The fifth book in the long-running shared-world, dark fantasy, apocalyptic Sha’Daa Series is now available in Trade Paperback. You can purchase “Sha’Daa: INKED” right here at the Copper Dog Publishing bookstore. We’re working on the e-book version of INKED, which will soon be available on Amazon Kindle. The Sha’Daa is coming… Are You Ready?